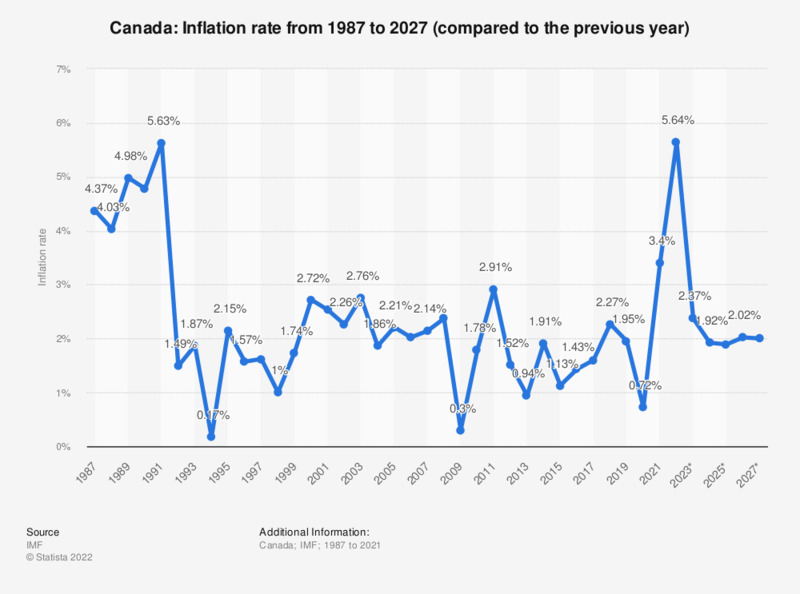 The statistic shows the average inflation rate in Canada from 2014 to 2018, with projections up until 2024. The inflation rate is calculated using the price increase of a defined product basket. This product basket contains products and services, on which the average consumer spends money throughout the year. They include expenses for groceries, clothes, rent, power, telecommunications, recreational activities and raw materials (e.g. gas, oil), as well as federal fees and taxes. In 2018, the average inflation rate in Canada was approximately 2.24 percent compared to the previous year. For comparison, inflation in India amounted to 5.22 percent that same year. In general, the inflation rate in Canada follows a global trend of decreasing inflation rates since 2011, with the lowest slump expected to occur during 2015, but forecasts show an increase over the following few years. Additionally, Canada's inflation rate is in quite good shape compared to the rest of the world. While oil and gas prices have dropped in Canada much like they have around the world, food and housing prices in Canada have been increasing. This has helped to offset some of the impact of dropping oil and gas prices and the effect this has had on Canada´s inflation rate. The annual consumer price index of food and non-alcoholic beverages in Canada has been steadily increasing over the last decade. The same is true for housing and other price indexes for the country. In general there is some confidence that the inflation rate will not stay this low for long, it is expected to return to a comfortable 2 percent by 2017 if estimates are correct.